The narrative knits thirty years of historical and family research into the seams of a contemporary journey of discovery. Ichabod is missing. The author sets out to solve the mystery of his disappearance two hundred years ago. Unconventional methods unearth his diary. A farmer, medical practitioner, shoemaker, and religious liberal, Ichabod Foster survived two wars with Great Britain, participated in the birth of Vermont, and migrated to the Holland Purchase lands of western New York when he was seventy-one years old. In a cramped, snow-covered log cabin beside the dead bodies of his son, brother, and sister-in-law, Ichabod took his last breath January 1, 1813. 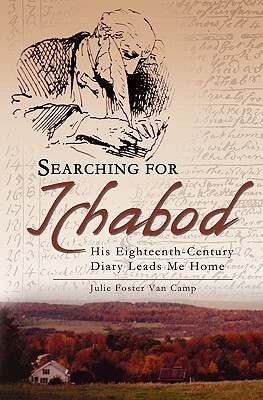 In her quest to find Ichabod's grave, Van Camp digs beneath primary source materials to uncover universal themes of death, birth, religion, survival, and war. People she bumps into while traveling through Rhode Island, Vermont, and New York reinforce her sixth-sense encounters. Description: The narrative knits thirty years of historical and family research into the seams of a contemporary journey of discovery. Ichabod is missing. The author sets out to solve the mystery of his disappearance two hundred years ago. Unconventional methods unearth his diary. A farmer, medical practitioner, shoemaker, and religious liberal, Ichabod Foster survived two wars with Great Britain, participated in the birth of Vermont, and migrated to the Holland Purchase lands of western New York when he was seventy-one years old. In a cramped, snow-covered log cabin beside the dead bodies of his son, brother, and sister-in-law, Ichabod took his last breath January 1, 1813. In her quest to find Ichabod’s grave, Van Camp digs beneath primary source materials to uncover universal themes of death, birth, religion, survival, and war. People she bumps into while traveling through Rhode Island, Vermont, and New York reinforce her sixth-sense encounters. Julie Foster Van Camp was born and raised in Cedar Rapids, Iowa, the daughter of a Washington County farm boy turned pediatrician. She has a BA in journalism from the University of Iowa and an MS in criminal justice from Northeastern University in Boston. Her articles have appeared in Ancestry, Western New York Heritage, New England Ancestors, The Christian Science Monitor, The San Francisco Examiner, The Judges Journal, and various American Bar Association publications. Her books include Courts and the Classroom (Supreme Judicial Court of Massachusetts, Boston, MA) and State Courts and Law-Related Education (Phi Alpha Delta Law Fraternity, Washington, DC). After retiring in 1992, she moved to Lopez Island, Washington, where she writes and volunteers as a nonprofit management consultant.